This page documents some of the work I have undertaken during the second part of my career when higher education became my field of work and study. I have been very fortunate in the organisations I have worked for, the roles I have had and the people I have worked with. HMI assessed the quality and standards of public sector (Polytechnics and Colleges) educational provision through direct observation and inspection and advised the Secretary of State for Education on the performance of the system nationally. Role: The HMI role carried considerable responsibility and required a combination of specialist knowledge and general knowledge of the education system and in the evaluation through an evidence based approach of quality and standards. National responsibility for Geoscience Education. First point of reference for matters relating to "Safety" in Higher and Further Education. * Over 80 inspection reports and contributed to some twenty published reports. *Compiled the evidence base for the 1991/92 higher education section of HMI's annual report. * Published a report on geoscience education and training in the polytechnics and colleges. * Principal author of the consultative report, "Review of Earth Science Degrees," issued by the Geological Society, (Professional Body). I successfully completed the Ofsted (Office for Standards in Education) course which qualified me to participate in the Schools Inspection programme although I never did this - thank goodness. The Higher Education Funding Council for England was the body responsible for funding teaching and learning and has statutory responsibility for the quality and standards of the education it funded. Role: as a Reporting Assessor I was responsible for managing a team of Subject Assessors, planning and conducting one of the first Quality Assessments (in Chemistry) and preparing the unpublished Institutional Feedback Report and the published Assessment Report. Part of my contract involved the structured analysis of Institutional Self‑Assessment documents in Chemistry and preparing evaluation reports for the Funding Council and consideration of appeals. The University of Plymouth is a medium sized regional (SW England) University with its roots in the Polytechnic system. *Academic audit (testing the performance of Faculty based quality assurance arrangements). * Enquiry (penetrative and constructive investigations into serious problems or policy related matters). * Quality assessment (preparing and supporting departments for external subject review – including subject self-evaluations). These accountability functions were combined with a range of activities designed to enhance the institutions capacity to evaluate its own academic performance. * Developed and successfully applied audit and enquiry policies in an environment that was, at least initially, hostile to the idea of audit. * Prepared the university for two HEQC audits and co-ordinated its response. * Assisted departments in seven HEFCE Quality Assessment visits (four excellent and three satisfactory ratings). * Developed, piloted, evaluated and implemented a University-wide Student Perception Questionnaire aimed at gaining feedback on their learning experience. * Helped to resurrect the university's teaching and learning newsletter and edited two issues of the newsletter. * Developed a 'learning from audit' series of pamphlets designed to disseminate good practice and highlight problem areas identified through internal audit. This role helped me discover that my passion lay in enhancement rather than quality assurance and the things I had done enabled me to secure my next job with HEQC. HEQC was established in 1992 to improve the capacity of HE to regulate itself. It had two primary functions : an audit function and an enhancement function. I joined the Quality Enhancement Group in March 1995 (part-time) and full-time from August 1995. The organisation was replaced by QAA in August 1997. Role: As an Assistant Director I was responsible for: a self-determined programme of work that embraced basic research, mapping and survey work, consultation, creation and drafting of policy, practical development work in new areas, advising institutions, disseminating practice through publications, conference presentations and inputs to institutional workshops and seminars. Member of the Graduate Standards project team. My main contribution focused on the modular and credit-based curriculum and the regulatory systems that underpin such frameworks. I also led development work aimed at gaining a better understanding of the meaning of level. Led a programme of work aimed at improving the capacity of HE institutions to evaluate and regulate themselves. Established a practitioners forum for those involved in institutional self-evaluation and audit. Led development work on benchmarking assessment practice. Member of a project team created by the Engineering Professors Council that developed a specification for a departmental quality management system, and supported implementation in six university engineering departments. Jackson NJ (1997) Managing flexible curricula in higher education: the architecture of modularity. Higher Education Quality Council London. Jackson N J (1997) Managing Quality and Standards in UK Higher Education, Approaches to Self-Evaluation & Self-Regulation. Higher Education Quality Council London. QAA was established in 1997. It is responsible for developing and managing the quality assurance regime that all institutions of higher education are subject to. Its functions include the review of institutional quality assurance arrangements and the review of the quality of education at subject level. Role: as a member of the Development Directorate Icontributed to the development of a national quality assurance framework based on recommendations made in the Dearing Review published in 1997. From 1998 I worked half-time. The concept, policy and guidance framework for programme specification. Contributed to development of other aspects of the new quality framework being established between 97-2000. Overseas activity: I made two invited visits to South Africa sponsored by the British Council to participate in conferences and institutional workshops. Reports of the visits are lodged with the British Council in South Africa. The University is a pre-92 technological institution with a strong research ethos.Between May 1998 and December 2003 I held a half-time appointment in the Department of Educational Studies. My research and scholarship (rated 4 in the 2002 RAE exercise) contributed to a Research Centre that is organised around the theme of Policy and Change in HE. Facilitated preparations including production of the Schools self-evaluation for the QAA Subject Review in December 2001 (rated 23 points). Organisation of a School-wide forum for teaching and learning. My scholarly outputs are listed below. Jackson N J 1998 Academic Regulation in UK Higher Education: Part III -the concept of partnership in trust. Quality Assurance in Education. v6 5-18. Jackson N J 1998 Potential role of credit in supporting a system of threshold standards in HE. In M Armstrong, P Clarkson and M Noble (eds) Modularity and credit frameworks the NUCCAT survey and 1998 conference report. Northern Universities Consortium for Credit, Access and Transfer. Jackson N J 1998 Pilot Benchmarking Study of Assessment Practice in Seven Engineering Departments. Managing Quality and Standards in UK Higher Education, Pilot Studies in Benchmarking of Assessment Practice. Quality Assurance Agency Gloucester p51-61. Jackson N J 1998 Benchmarking Assessment Practice : A Commentary. Managing Quality and Standards in UK Higher Education, Pilot Studies in Benchmarking of Assessment Practice. Quality Assurance Agency Gloucester p67-79. Jackson N J 1998 Facing up to the new realities in higher education and lifelong learning: ensuring high standards. Conference Proceedings - Facing up to the new realities in higher education and lifelong learning. ibc UK Conference Ltd.
Jackson N J 1999 Modelling change in a national HE system using the concept of unification. Journal of Educational Policy v p1-24. Jackson N J 2000 Understanding Benchmarking in Higher Education: Part 1 Introduction to the concept and application of the method. Accepted for publication in Quality Assurance in Higher Education. expected publication date June 2000. Jackson N J et al 2000 Programme specification : making the benchmarks explicit. Special Issue of Quality Assurance in Education v8 4 158-224 Jackson N J 2000 editor/author Programme Specifications Special Issue of Quality Assurance in Education v8 4 158-224. Jackson N J 2001 Benchmarking in UK HE: an overview. Quality Assurance in Education v9. Number 4 218-235. Jackson N J 2002 Principles to support the enhancement of teaching and students learning: implications for educational developers. Educational Developments Issue 3.1 SEDA. Jackson N J 2002 QAA Subject benchmarking. Special Issue of Quality Assurance in Education. Ufi is a state broker whose purpose is to facilitate the development and expansion of opportunities for learning in and through work. The LTSN Generic Centre was established in 2000 and is part of the Learning and Teaching Support Network. It brokered information and knowledge, facilitated networks and networking and helps develop professional communities with the aim of enhancing learning and teaching in higher education. Another important function of the LTSN was to help shape the thinking of policy makers and provide HE communities with a stronger voice in national debates and discussions. Role: I was a broker working to bring ideas, people, resources together in creative ways to develop new things and improve adapt existing things. An extensive programme of work to and evidence base on which to base policy and practice on personal development planning. Member of the National Progress File Implementation Group. Initiated and led the Imaginative Curriculum project which examined ways of nurturing students’ creativity (www.imaginativecurriculum.net). Research and development work on the enhancement of support for external examiners. Development and leadership of the Change Academy: a new concept in team-based professional development. A network for people leading quality enhancement in HE institutions.A network for people involved in institutional research. 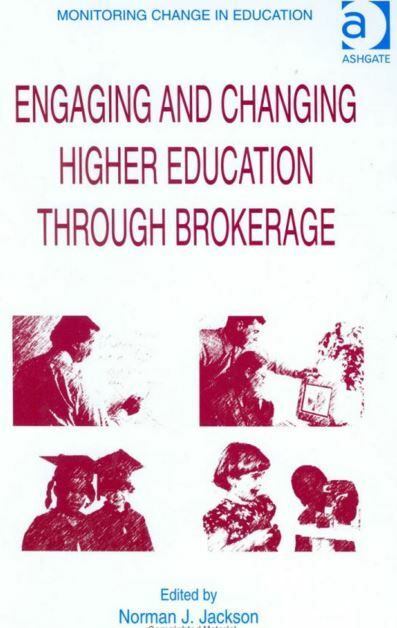 Jackson N J 2003 Engaging and Changing Higher Education through Brokerage. Ashgate Press. Provided advice to the Burgess review of Measuring and Recording Students’ Achievement. Leadership and management of a substantial programme of work aimed at improving the support given to external examiners and external examining. Quality Enhancement Network for people who lead major enhancement projects within institutions. Institutional Research Network for people involved in researching practice within institutions and also policy makers and systemic researchers. Facilitated public discussion on the meanings of evidence based practice in higher education, how we accomplish complex change in higher education institutions. Conceived and led an experiment in the building of data bases to facilitate an evidence based approach to personal development planning. Led the development and implementation of the Change Academy for institutional team-based change projects. Jackson N J 2003 Magic Sparks in C Baillie (ed) Travelling CASE Creativity in Science, Arts and Engineering. Jackson N J 2003 The humble word map: a simple but powerful aid to collaborative knowledge building in C Baillie (ed) Travelling CASE Creativity in Science, Arts and Engineering. Jackson, N J 2004 Developing the concept of metalearning. Innovations in Education and Teaching International 41(4), 391-403. SCEPTrE was one of 74 Centres for Excellence in Teaching and Learning established between 2005-06 as a national policy for rewarding excellence in teaching and learning and broadening and deepening its impact. Established the Centre appointing and managing its staff and resources. Was responsible for the design of the Centre’s learning spaces. Created, in negotiation with stakeholders our strategies and work plans and was accountable for their delivery. Developed our Fellowship policy for rewarding excellent teachers. Led the creation of the educational vision (life-wide learning) and conceptual underpinnings that guide our pedagogic work. Contributed directly to the innovative practices we have developed through our concept of life-wide learning and life-wide curriculum. A series of Academies around the themes of creativity, experiential learning, culture, business and social enterprise and digital story telling. A student organisation – CoLab. Exploration of pedagogic themes like experiential learning, immersive experience, productive enquiry, professional capability. Extensive exploration of the idea of learning to be professional through a higher education, including editorship of an e-book. Development of the concept of life-wide learning and the infrastructure to support a life-wide curriculum. Jackson, N. J. 2008 A Life-wide Curriculum: Enriching a Traditional WIL Scheme through New Approaches to Experience-based Learning. Proceedings of the WACE Symposium Sydney 2008. Jackson, N. J. 2010 From a Curriculum That Integrates Work to a Curriculum That integrates Life: Changing a University’s Conceptions of Curriculum. Higher Education Research & Development, Work Integrated Learning Special Issue 29 (5): 491–505. Jackson, N. J., Fellows, C. and Leng, J. 2010 Adding Value to the Education of Nurses, Midwives and Operating Department Practitioners through a ‘Life-wide’ Curriculum, Nurse Education Today, 30 (2010): 271–5. and with the help of Jenny Willis and all our contributors we publish a magazine 2 or 3 times a year each issue exploring a dimension of lifewide learning. We have over 500 subscribers to our community and with the help of Jenny Willis and all our contributors we publish a magazine 2 or 3 times a year each issue exploring a dimension of lifewide learning. We also support Chrissi's #creativeHE online conversations and courses. Between October 2011 and December 2012 I was commissioned by Southampton Solent University to undertake an interview based study of how the university had changed through a 3 year strategic development programme. The results of this study will be published in a book in January 2013. It has provided an opportunity to further develop my understandings of how change is brought about in a university.